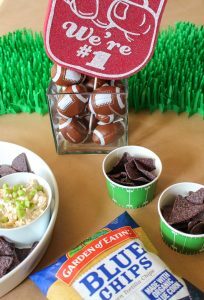 Calling all football snack fans!!! Did you make a resolution to eat healthier this year? If so, never fear; you can enjoy watching football while indulging in better-for-you game day snacks. 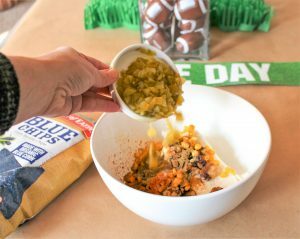 Today, we are sharing a delicious recipe to spice up your football homegating spread. Living in Houston, we are certainly accustomed to southwestern flavors. And, with Tex-Mex available on just about every corner, we are also lovers of all things chips and dip. 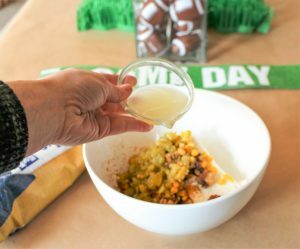 So, as the Big Game approaches, we wanted to share one of our favorite game day snacks to pair with- Garden of Eatin’® Blue Corn Tortilla Chip–corn walnut dip. 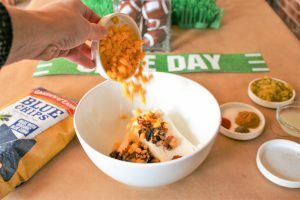 This unique dip is full of wholesome ingredients, allowing you to feel good about your snacking choices during the Big Game. 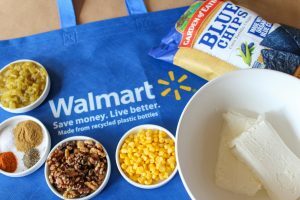 We picked up all of our corn walnut dip ingredients at Walmart, making shopping and preparing for the Big Game quick and simple. 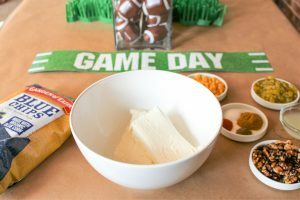 Keep scrolling for the full recipe, and one of our favorite game day snacks. Beat cream cheese at medium speed with an electric mixer until smooth, then gradually add lemon juice, beating until combined. 3. Stir in corn and remaining ingredients through chilies. 4. Cover dip and chill for at least one hour (or overnight). 5. Garnish with sliced green onions prior to serving. 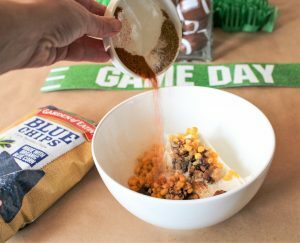 This game winning dip, deserves to be paired with the mother of all chips, Garden of Eatin’® Blue Corn Tortilla Chips. 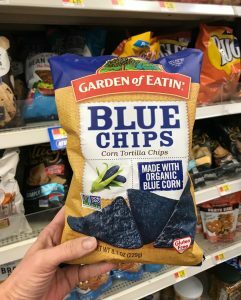 These blue corn chips are made with organic blue corn and organic whole corn kernels, without artificial colors, flavors or preservatives. 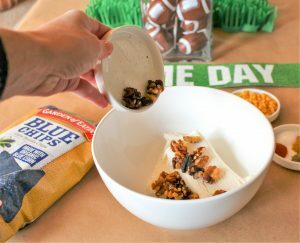 The combination of these blue corn chips and our corn walnut dip makes for one of our favorite game day snacks. 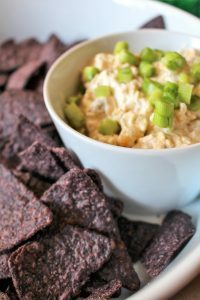 You can find all of the ingredients for this corn walnut dip, including the delicious Garden of Eatin’® Blue Corn Tortilla Chips, at your local Walmart. Be sure to look for Shopkick Rewards while offers last. Look for savings on specially marked packages and save up to $7. Save $2 when you buy two different brands from the following: Terra® Chips, Sensible Portions® Veggie Straws, Garden of Eatin’® Tortilla Chips starting later this month.